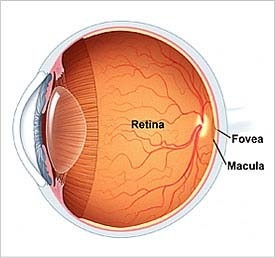 The retina is the most important vision forming part of the eye from where visual impulses are transmitted to the brain. It is the thin innermost coat of the eye and receives light impulses transmitted through Cornea and Lens of the eye. The normal retina is in firm contact with its underlying structure called Choroid which supplies blood to the Retina. 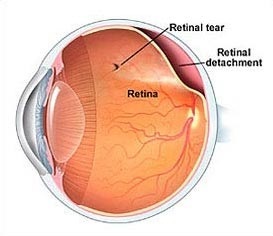 Separation of this retinal layer from its underlying structure is called Retinal Detachment. So, the retina which was receiving light signals till now is no longer functioning due to its detachment from the original position and that eye loses its visual function. That’s why the patient with Retinal Detachment complains of sudden painless loss of vision. A person with high minus power of glasses (High Myopia), history of blunt ocular injury, diabetes, family history of retinal detachment in close relatives and patients with peripheral retinal degenerations. Loss of vision in Retinal Detachment can be partial or complete depending on the amount of retina detached. Immediately after Retinal Detachment, the patient will see lots of floaters i.e. 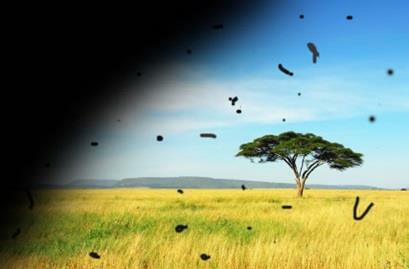 multiple black spots moving and flashes of light inside the eye with some curtain like shadow obstructing their vision. Floaters and flashes are due to the ‘pull and tearing’ on part of the retina. As time progresses partial detachment converts to complete detachment with a total loss of vision. So, anyone with these kinds of symptoms (even if it is just floaters) which are sudden in onset should report to Retina Specialist immediately. Treatment of this condition is only by surgery. There are two major types of surgical repair of Retinal Detachment; one where surgery is performed from outside of the eyeball by placing a silicone implant (Scleral Buckle) and second is when we perform surgery by entering inside the eye with help of endoscopic instruments and repair it internally (Vitrectomy). The success of surgery depends upon multiple factors, but the single most important factor is the timing of surgery, earlier the surgery is performed after onset of Retinal Detachment better is the visual outcome as permanent damage to the retina is least in this condition. Prevention: Prevention of Retinal Detachment is not possible, only thing possible is routine retina check-ups of at-risk patients as mentioned earlier so that advanced complications due to Retinal Detachment can be prevented. Retina services at AEHI are the best in Navi Mumbai and offer specialist retina consultations, all retina tests like OCT, Fundus photo and retina angiography. Retina surgeons are expert in various Retina surgeries like Vitrectomy, Scleral buckle for detachment, Laser for retina and intravitreal injections.